#KenyaPoll : Uhuruto to get 90+ percent turnout votes as the rest share at least 2 percent. - Bana Kenya News, Real African Network Tubanane. Home featured News #KenyaPoll : Uhuruto to get 90+ percent turnout votes as the rest share at least 2 percent. #KenyaPoll : Uhuruto to get 90+ percent turnout votes as the rest share at least 2 percent. People from the Central region and Rift Valley have flocked in their polling stations in large numbers compared what was in August polls. The people from those areas have also turned up in various towns including Mombasa, Nairobi, Lamu, Taita Taveta and Tana River. At least 90% of those people in the NASA strongholds have come out to vote despite security challenges. The President will be expected to get at least 90 percent of the turnout votes as the other presidential candidates will share the 2 percent. "I had to vote because all my family in Rural are voting and we need to make sure our Son stays as the President of Kenya. Mombasa has no security problems and as you can see we are only four of us here." Muriuki Kamau said at Sacred heart polling station in Mombasa. "We need to exercise our democratic right as true citizens of this country. 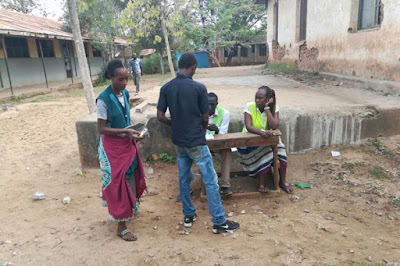 I urge everyone to go and vote because it is only voting that will make our country move forward," Kibicho Paul said at Ziwa La ng'ombe Polling station in Mombasa.